"The Angel gets its Wings"
We had the good fortune to visit the home of the wonderful artist, Rudolfo Morales, who lives in the small village of Ocotlan, not far from Oaxaca, Mexico. A man of modesty and magnanimity, he has shared his good fortune with the villagers of his home by establishing a foundation to restore important sites and churches in the area, using local labor, and by opening his house to the children of the village, where they can learn how to use computers in a rooftop computer classroom. 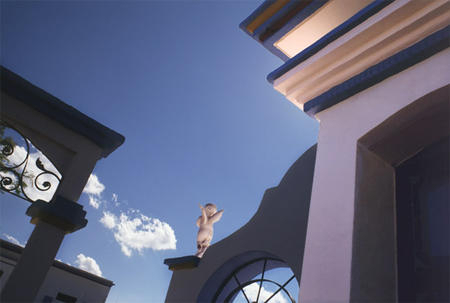 This photograph of a cherub trying out its wings is taken adjacent to Mr. Morales's rooftop studio. He has given wings to many in his town as well as to all who have had their imaginations take flight by seeing his magical paintings.